Wilfrid Laurier University is saddened by the passing of Donald Morgenson, a long-time, award-winning faculty member who was known and loved by generations within the Laurier community. Morgenson, who was professor emeritus in the Department of Psychology, began his career at the university in 1960, following the completion of an internship at the Mayo Clinic in Minnesota. 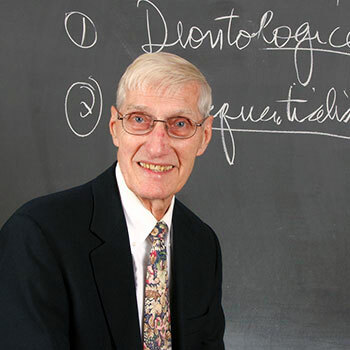 He enjoyed a distinguished career in the field of clinical psychology. Morgenson was born in Rochester, Minnesota. He graduated with a BA from St. Olaf College in Northfield in 1950, where he sang in the chapel choir, participated in the drama group Campus Players, was involved in track, and served as captain of the swimming team. He received an MS degree from Pennsylvania State University in 1952, where he served as a graduate and research assistant, counsellor, and psychologist at the speech and hearing clinic. He earned a PhD from the University of London. Morgenson was a sergeant in the U.S. Army from 1952 to 1954, serving in Trieste. During his long and distinguished career at Laurier, he enjoyed teaching and engaging with students — he served as dean of students early in his career from 1962 to 1964 — and was a constant source of inspiration to his students. Among his several awards, which included Laurier faculty awards, was the prestigious Canadian Professor of the Year in 1986. A former student commented on this honour, saying, "The most remarkable aspect of Dr. Morgenson was his enormous and diverse interests and talent… A student could, in one day, attend his lecture, meet with him regarding career plans or personal issues, help him formulate a speech to a group of guidance counsellors, and then play basketball with him in the gym late that night." Morgenson was also involved in the community. He was a local and national board member of Big Brothers and Big Sisters, served as president and board member of the Waterloo County John Howard Society, and was past president and regional co-ordinator of Amnesty International. His perspective on the human condition and human motivation drew on psychiatry, counselling, as well as a broad knowledge of anthropological issues, history and literature. He shared his insight through frequent publications, including in national outlets such as the Toronto Star, where he wrote, "What is life without passion?" and in The Cord, where he analyzed issues from gun violence and the writings of Fyodor Dostoyevsky to the anxiety, stress and social influences faced by Laurier students. Morgenson officially retired from Laurier in 1994, but continued teaching for years. During his tenure, he taught three generations of one family: grandparent, father and son. In 2014, reflecting on his more than 50 years as a professor, he said, "even as a teacher, my students have taught me infinitely more than I have taught them." Many individuals from the Laurier community have shared their thoughts and remembrances of Morgenson on Twitter. Laurier’s Department of Psychology, located in the Science Building, has a book in their office, until April 21, for students and faculty to sign and express their condolences. The book will be given to Morgenson’s family.